Tanya Khovanova's Math Blog » Blog Archive » Where is My Team Now? Where is My Team Now? 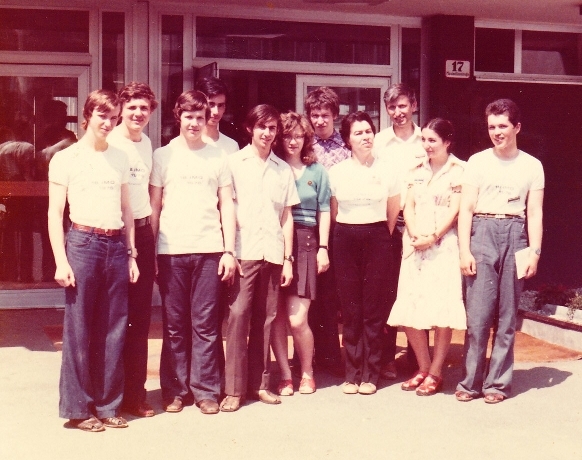 I was at the 1976 International Mathematics Olympiad as part of the USSR team. There were eight people on the team and I decided to find out what they have achieved in the last 40 years. Here is the picture of our team. From left to right: Sergey Finashin, Yuri Burov, Nikita Netsvetaev, Boris Solomyak, Alexander Goncharov, Tanya Khovanova, Sergei Mironov, our chaperone Z.I. Moiseeva, our team leader A.P. Savin, no clue who this is (probably a translator), Piotr Grinevich. The list below is ordered by the number of points received at the Olympiad. Tanya Khovanova, 39 points: a lecturer at MIT. I am interested in a wide range of topics, mostly recreational mathematics and have written 60 papers. Sergey Finashin, 37 points: a full professor at Middle East Technical University in Turkey, who is interested in topology. He wrote 40+ papers. Alexander Goncharov, 37 points: a full professor at Yale University. He is the highest achiever on the team. He won the EMS Prize in 1992 and was an Invited Speaker at the 1994 International Congress of Mathematicians. He is interested in geometry, representation theory, and mathematical physics. He published 75 papers in refereed journals. Nikita Netsvetaev, 34 points: a full professor at Saint-Petersburg University in Russia. He is interested in topology and algebraic geometry and wrote 20 papers. Boris Solomyak, 31 points: a full professor at Bar-Ilan University. He is interested in fractal geometry and dynamical systems and wrote 90 papers. Piotr Grinevich, 26 points: a leading scientific researcher at the Landau Institute for Theoretical Physics. He also teaches at Moscow State University. He is interested in integrable systems and wrote 80 papers. Sergei Mironov, 24 points. Sergey became very ill while he was an undergrad. He stopped doing mathematics. Yuri Burov, 22 points. Yuri wrote two papers, but quit mathematics after graduate school. He died several years ago from multiple sclerosis. Six out of eight people on our team became mathematicians. Or more precisely five an a half. I consider myself a mathematician and am grateful for my position at MIT, where I run innovative programs for young mathematicians. But in the research world, a lecturer is a nobody. This makes me sad. I had to take breaks from research in order to raise my two children. And then I had to work in the private sector in order to support them. I was the best on my team and now I am the only one who is not a full professor. If you are looking for an example of how gender affects a career in academia, this is it. Credentials have a role in society, but credentials are not what makes a mathematician.